This section of the contained all the various rumours and gossip that was submitted over the years. For each one we marked them as either True or Hoax depending on if the information turned out to be accurate. Thanks to Frederik for this new translation. "The allocations that were **1 from the Valenzetti equation should be kept at a distance as defined by the **2." **1 = This part of the text was sort of unclear. To have the sentence make sense, I think the best word to put here is either "produced" or "conjured". Remember the Orchid video? I took the liberty of looking up the Casimir effect, as have probably you, and lo and behold. It's quantum physics and has to do with two similar objects and an attraction force that forms between them when they are a few atoms apart from eachother. The Orchid video said "the unique properties of the island aided a kind of casimir effect" meaning that (except for the fact that it also means that the island seems to be manipulatable in a lot of different ways) it could be anything that has to do with a force that takes form in between two similar objects. Doesn't really have to do ANYTHING with the actual Casimir effect, there could just be a similar principle involved. Also keep in mind that "produce" is a loosely used word in this context. **2 = I couldn't come up with an adequate translation, i'm not really english, but the phrase talks about a law. The direct translation of the phrase is "on the lawground's specified distance." Basically, when the phrase is used, the word "law" is relative to any laws involved with what the phrase is being used in context with. Meaning, in this case they are either talking about the laws of physics, the rules of dharma or the safety measurement regulations of the Orchid maybe. Basically, the whole thing is hard to translate, there are some terms being used for which there aren't really any english translations that i know about. Now onto the second rabbit picture. "It is very well possible for two different allotments to break the rule of distance, but it should be avoided if possible". "In the case of a dire emergency, you and your group should return to the deserted areas, alternatively, to the zero point. 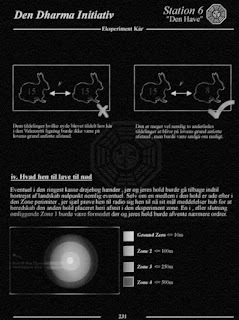 Even though a member in the group is caught outside the Zone perimiter, you yourself should try and radio the target information hub to alert the other team located elsewhere in the experiment zone. 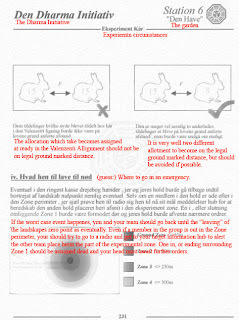 Someone in, or around Zone 1 should presumably be dead, and your group should awair further orders." Found this interesting post from DocArzt over at TheTailsection and a big thanks to Joakim ha for the translated version at the end. An interesting email arrived for me this evening. 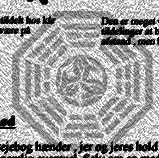 It contained what appears to be a scan of a mimeographed sheet from a Dharma Initiative project manual. Problem is, it's in Norwegian. As it turns out, automated translators don't play nicely with Norwegian. The results were, in a word, meaningless. Certain parts seemed to make sense, but only by severely skewing the context of phrases that otherwise looked pretty damn random. 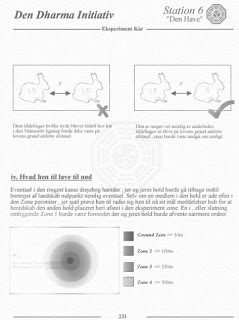 So I'll post a couple of versions of the page here, and if anyone speaks Norwegian, or knows someone who does, perhaps you can share with us what it says. It is, of course, highly likely this is not canon and just produced to drive us all crazy. I assure you, I will get some kind of confirmation one way or the other. However, those of you who followed our contribution to The Lost Experience may recall that we were called upon to spread information that was canon, and dutifully obliged; so there is a slim chance. HOAX : More Finale Details Leaked?? TRUE : Script Pages for Series Finale Leaked? HOAX : Matthew Fox and Josh Holloway "Not Speaking"
HOAX : Lacey Chabert to get "Lost"? HOAX : New Season 6 Promo? HOAX : Harold Perrineau not returning to Lost?